How To Create a Rock Logo? Appearing in the late 50s of the last century as one of the musical styles, rock quickly won the hearts of admirers, so hard that it divided into thousands of flows and subflows. 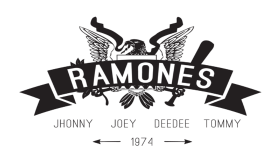 To create a single logo that is universally "appreciated" by all the rockers is very difficult, because there is so much hidden under the short word "rock" that it cannot be replaced, even if you try hard. If you need a symbol that will unite the heterogeneous audience as much as possible, then it's better to turn to the end of the 70s, when hard rock was on the stage, having become a transition from a light rock'n'roll to heavier genres. Metal-group should have an emblem in which the main role is played by chrome parts with sharp corners and other metal surroundings. Punks like everything unnatural and mystical. As for the logo's color filling, pay more attention to black, brown, red, metallic for classic rock and heavier styles, adding more green if the mark is needed by punks.A classic example of a rock logo belongs to Metallica, Rolling Stones, Linkin Park and Bon Jovi. How do I create a rock logo for my brand?